Hollandspiele: 170CE. Plague ravages the Empire. With the Legions depleted by disease and spread thin across the endless frontier, opportunistic Germanic tribes and fierce Sarmatian raiders strike across the Danube deep into Imperial territory. To face this threat, the Emperor Marcus Aurelius, an untested commander who has never set foot outside of Italy, must transform himself from an introspective philosopher into a cunning warrior and fearless leader. 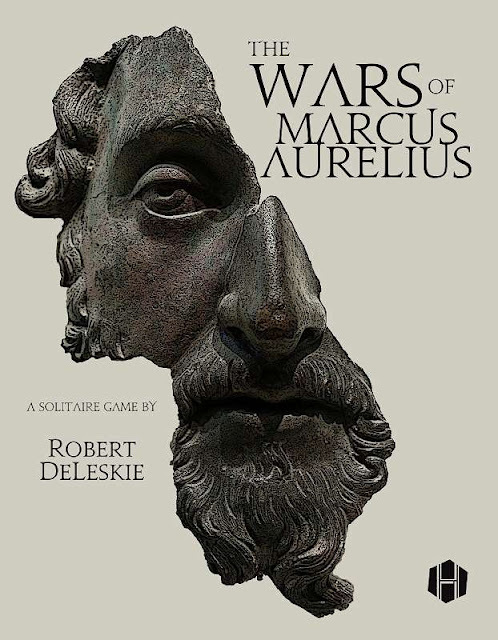 This debut game from filmmaker and designer Robert DeLeskie was created for BoardGameGeek's annual Wargame PNP Contest, where it was crowned the Overall Winner. Additionally it won all but one of the other categories in which it competed, including Best Rules, Most Original Concept, Best Solitaire Game, Best Strategic Scale Game, and Best Short/Quick/Small Game. Working with Hollandspiele's development team and playtesters, Mr. DeLeskie has expanded upon his original design, resulting in a richer and more varied decision space that rewards repeated plays and multiple strategies.